(WEEI.com) – So what do you get when you don’t fix a blue line that was the worst it’s been in years? A room full of prospects smiling ear-to-ear on the first day of rookie camp because they think they’ve got a shot at playing in the NHL this season. Of course. We all have the right to vote. We all have the right to free speech. We all have the chance to play defense for the Boston Bruins this year. No one is blocking us. I do get what Don Sweeney is doing here. He’s pumping up the kids. He wants them to seize the moment. I do like the idea of Brandon Carlo, or whoever may be NHL ready, getting a chance to be an opening night player for the B’s. But let’s call it what it really is. Sweeney didn’t fill the gaping holes on D this summer or at the 2015-16 trade deadline when he had Loui Eriksson as prime currency. Now he NEEDS some one to step up. But just out of curiousity, who was actually blocking who last year? Was Matt Irwin and Zach Trotman really blocking Colin Miller? Really? They didn’t get an NHL ready replacement for Dougie Hamilton last summer so essentially it’s just the same story all over again. Except this time it’s attached to the dreams of young defenseman who may not be ready. And if the young bucks seem to be a bit of a stretch but make the roster is that really what’s best for them and the organization? I am glad it’s wide open for anyone but it kind of shouldn’t be if the Bruins are selling the playoff dream again this year. This should have been taken care of already. 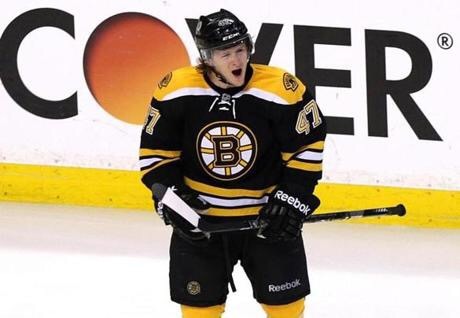 Instead, our boy Torey Krug is the lone d-man capable of carrying the blueline load. Let’s hope Carlo is ready. It’s pretty obvious Sweeney is begging for it. Next Next post: Brad Marchand Gets Paid!